Art in prison is a dangerous thing. It is dangerous because art is about being bothersome – asking difficult questions, challenging what everyone else takes for granted, triggering deep emotions. And prison is about keeping trouble to a minimum. Art is also about finding your own voice, recognising your right to exist in this world and to be heard no matter what your message. And prison is about following rules, not making a fuss and getting your head down. These qualities of prison are the nature of all large, secure institutions and not a reflection of the aspirations of a particular prison service. In fact in Scotland we are seeing a real striving to operate a different kind of penal system – one that sees and builds on a person’s strengths rather than shaking a finger at their deficits. I will be watching these developments with interest, but I will need a lot more convincing before I think the chains of institutionalization have been broken. Some of the qualities of art in prison fit neatly into official aims to reduce reoffending: learning a skill, gaining a work ethic, improving self-esteem, cooperating in a group. These are also the aspects of arts programmes most loudly trumpeted in research and evaluations. This can be dangerous as well: emphasising its most policy relevant effects risks seeing art as just another intervention which can be harnessed by agencies to fix broken people. Sometimes art needs to break things, and it can never be made fully compliant with a prison regime. How can these inherent and fundamental contradictions be reconciled? How can art both teach a person to challenge rules, and yet improve their ability to obey them? I personally wonder if such a thing is possible, but having been involved in guest editing the third issue of Scottish Justice Matters have been amazed at the work, and curiosity and reflection, featured in the magazine. This shows the quality of arts engagement in many justice settings in Scotland, and also strong advocacy and support within justice agencies. Kirsten Sam’s earlier blog really captures for me what can and should be done with arts in criminal justice. We had an artist in residence at our Centre during most of 2012 (Jenny Wicks, and you can learn about her wonderful work here: http://punishingphotography.wordpress.com/ ). I can only think that my involvement in that project is the reason I have been getting invited to various arts and justice events and treated as knowledgeable on the subject. Not knowing much about something has its upsides. You can hear how people who do know about this stuff talk about it and you can see more easily the assumptions and jargon in play. At one arts and offenders workshop (outside of Scotland), an artist talked about prisoners lighting up like children at Christmas when being given the opportunity of making art with her. Another artist talked about giving prison managers a veto power over prisoner made artworks being sent to a community-based exhibition. This was a point made to show awareness of the ‘security needs’ of the prison. I wonder whether Guernica would have made it out of prison if Picasso had painted it there, and wonder what security need of the prison would dictate its involvement in deciding what art is worth being seen by the public. Maybe a victim issue? A libellous statement? An escape plan? We’ll never know because a prison has decided what we are allowed to hear from people inside. What is most sad is that the artist has become complicit in this process of silencing. And when we compare prisoners to children we buy into an identity that separates and lays a hierarchy on us and them: warders and inmates, security protectors and threats, knowing and unknowing. I trace my deeply conflicted feelings about the Koestler Trust exhibitions to these concerns. Are we giving the dispossessed a voice or the possessed an opportunity to gawk at the caged? Is art opening up a new way of positioning oneself in the world, or a means of locking in an identity tied to an invariable narrative of a sad childhood leading to criminal justice control? Many of the contributions to the Arts and Justice issue tackle these concerns head on, and I am in awe of artists who are able both to work within the rules of criminal justice environments while spurring the creative aspirations of those they work with. They are finding ways to, metaphorically, break down walls in which we often imprison ourselves – helping us ignore the voice in our head that says we can’t do it, no one wants to know, it’s a silly idea. The work of Lieux Fictifs in Marseille, France literally ignores the wall (see the article by Caroline Caccavale and Sophie Dominique*). With the full support of their prison, they bring in local residents and students to make film and theatre alongside prisoners and develop a sense of community in the process. Their success exposes that much of what is passed off as a ‘security need’ is a way of stigmatizing some people as a constant source of danger, a form of radioactive waste that is never safe. In contrast, Lieux Fictifs’ efforts recognise that the people who are in prison today were our neighbours yesterday and will be again tomorrow. We better find some way of getting along. I don’t expect that my co-editor or the Editorial Board of SJM will agree with all of my comments here. But that is the beauty of free speech; it is a prerequisite of art that we are freed to say what we think. This is not to say we are freed not to care about others’ thoughts or feelings, but rather are empowered to place our own thoughts and feelings at the same level as others’, deserving of equal respect and consideration. Our own artist in residence project allowed me to see what I do through different eyes, to think about how criminological research contributes to changing or entrenching existing boundaries and practices. I would like to see more engagement of people like us in artistic work to include prison guards, civil servants and social workers, helping us shed our institutional identities in order to develop a sense of our connections, and disagreements, as people. *Sophie Dominique was mistakenly omitted from her role in this contribution, entirely a fault of the editors. Sarah Armstrong co-edited our Arts and Justice issue and is a Senior Research Fellow based at Glasgow University. 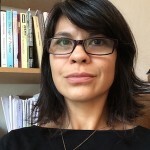 Her research interests revolve around prisons and punishment: policy processes that shape and sustain them; language practices that inform and construct them; market and governance forces that expand and contain them.